If you believe in your product you try to sell it to as many people as you can. If you are fanatical about your product you design a website to evangelize others to its use. 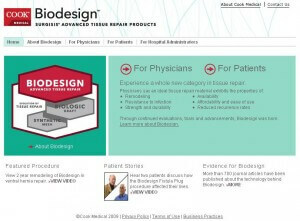 Cook Medical produces a tissue regeneration matrix called Biodesign that we’ve praised before. Yesterday, the company launched CookBiodesign.com, a website devoted to explaining the benefits and successes of the matrix. Involved in more than a million procedures worldwide, Biodesign is a well tested alternative to synthetic meshes and biological grafts. Not bad for a product derived from pig intestines. CookBiodesign provides a persuasive argument for patients and physicians to use their product: a tissue regeneration matrix. When someone loses a large amount of skin, or has a weakened pelvic floor, or a hernia, doctors need to induce the body to regenerate over a large surface. Biodesign works by providing a scaffold for tissue growth that also contains all the necessary nutrients for incoming cells. In this way, the matrix encourages tissue generation and is eventually replaced by the body’s own cells. It’s an ingenious system and you can refer to our previous coverage if you want to know about how it works in greater depth. A big advantage the Biodesign matrix has over synthetic scaffolds is that it eventually is absorbed by the body. Traditionally, synthetic meshes are made of nylon and while skin and other tissues will grow on the mesh, the mesh then remains in the body forever. That can cause problems with flexibility and long term healing. Synthetic meshes also don’t allow the body’s immune system to protect the tissue while it grows. The second option, biological grafts, take tissue from one portion of the body and place it in the needed area. These grafts are limited in availability and complex to produce, but they do allow the immune system to function during healing. Biodesign’s matrix derived from pig intestine improves on both options: it is a durable scaffolding that disappears after it is used, and it is a readily available solution that has the full support of the body’s immune system to protect the tissue. It’s common for medical companies to have well designed websites to support their products. In fact, such promotional information is rapidly becoming a necessity. CookBiodesign hopes to garner a following by collecting all of the data a prospective patient or physician might need to make an informed decision in one place. There are press releases, doctors reports, product data sheets, patient reports, papers from medical journals, and detailed animations. I’m personally a big fan of the videos demonstrating the surgeries where the matrix is used. Fair warning, these aren’t for the squeamish. As the internet becomes the definitive resource for information, companies will have to come up with reliable ways to control their public image online. I think CookBiodesign’s approach is one of the more ethical. They put all the data at your fingertips and trust that the overwhelming scientific evidence will persuade you. It will be interesting to see if other biotechnologies follow the same route and focus on data as much as hype.